These are easily portable appliances, which can be either wall mounted or kept on the floor for quick and easy heating for a single room. Perfect for situations where a quick heating replacement, or a simple alternative is required. 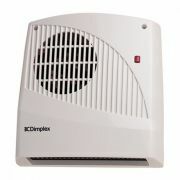 Manufactured from some quality brands such as Dimplex, our Kitchen and Bathroom heaters are at the height of electrical quality - we offer a minimum one year guarantee on all products orders online - and additionally, if you're not happy with your product for whatever reason, we also offer a 30 day hassle free returns policy.